Find out everything you need to know to ride DC’s world-class Metrorail system, get a Metro map, check operating hours, ride fares and more. Washington, DC’s Metro is one of the busiest public transportation systems in the country. Its expansive network of tunnels and above ground tracks connect all four quadrants of DC with suburban Virginia and Maryland. The system is heavily used by local commuters and it’s a popular, convenient and affordable way for visitors to DC to get around the region. 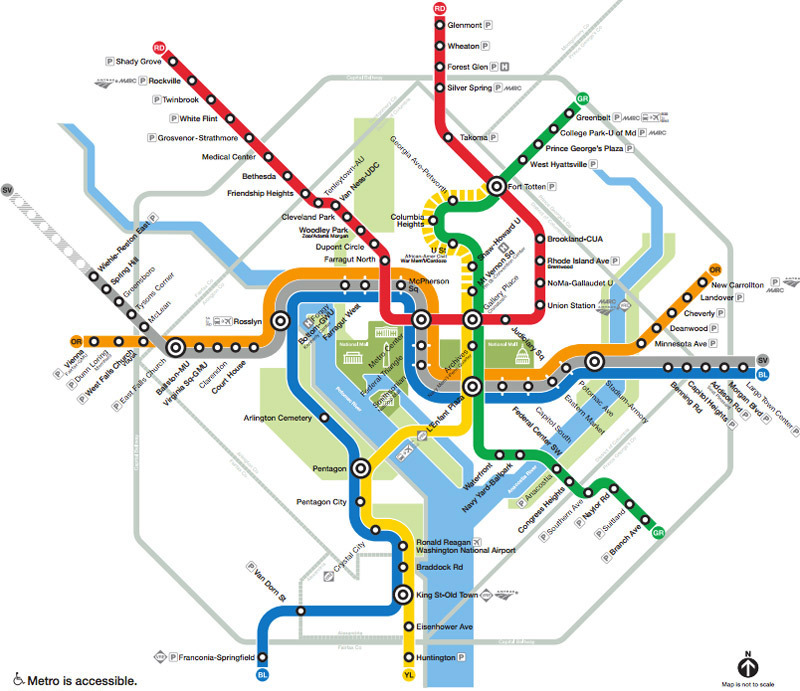 A Metrorail system map will help you navigate the nation's capital during your trip. Click the Washington, DC Metro map below to view a larger version. How does the Washington, DC Metro work? How do I plan my trip? The Metro consists of six color-coded lines: Red, Blue, Orange, Yellow, Green and Silver. The lines are connected to each other via transfer stations and many Metro stops are serviced by more than one color. Each train car has an exterior electronic sign that marks the color and the direction of the train. Direction is indicated by the final station of that line. Popular sightseeing Metro stops include the Smithsonian (Orange, Silver and Blue lines), Woodley Park-Zoo/Adams Morgan (Red line) and Gallery Place-Chinatown (Red, Green and Yellow lines). You can plan your trip and find the best route using Metro's Trip Planner. Worried about internet connectivity while traveling on Metro? Currently, most Metro stations have free Wi-Fi. What are the Metro's hours and when does it close? DC Metro trains run Monday – Thursday, 5 a.m. to 11:30 p.m.; Friday, 5 a.m. to 1 a.m.; Saturday, 7 a.m. to 1 a.m.; Sunday, 8 a.m. to 11 p.m.
During peak operating hours (weekdays, 5-9:30 a.m. and 3-7 p.m.), trains usually arrive every 8 minutes. At stations served by more than one line, trains will arrive every 3-4 minutes. At off-peak times, trains come every 12 minutes, while later trains typically arrive every 15-20 minutes. How much are Metro fares? Metro riders must pay via SmarTrip card. These are plastic, rechargeable fare cards that can be purchased by cash or credit at any Metro station or in advance on wmata.com. You can calculate your fare between two stops using Metro’s Trip Planner. The Washington, DC Metro serves thousands of commuters and visitors each day. Because the train system is so heavily used by busy local commuters, there are a number of unspoken rules that visitors should be aware of. If possible, you may want to ride at off-peak hours when the train system is much less hectic. When riding the escalator, stand to your right, walk to your left. Standing in a twosome that blocks the left side is strongly (and often loudly) discouraged by your fellow Metro riders. When waiting to board a train, let riders exit the train first before trying to board. If the train is particularly crowded and you are standing in a doorway, step just outside the train doorway to allow your fellow riders room to exit. Another important note if the train is crowded: move to the middle of the car so others can board. You will have time to exit when you arrive at your stop. During peak hours, trains arrive often. Don’t try to board a train that is too full. The automatic doors are very sensitive and if they can’t close, the train operator may offload the entire train because a door stopped working. Each car usually has several seats for handicapped riders. Please don’t use these seats if there is a rider that needs to sit down. Be sure and have your SmarTrip card out and ready to swipe when you go through the gate. Riders move through quickly and holding up the line is discouraged. While the Metro can be a very busy place, most of your fellow riders are friendly and will point you in the right direction. There is also a station manager at each station. Don’t be afraid to ask if you have questions about navigating the Metro! Now that you have read up on the Metrorail experience, learn about other ways to navigate DC. Check out the best transportation optoins for getting around the District.